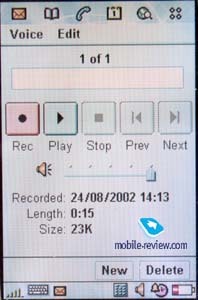 Review of SonyEricsson P800 smartphone. Part II. 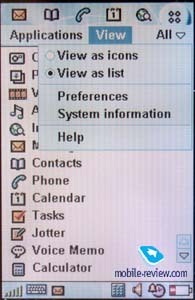 The operating system of the P800 is Symbian OS, version 7.0, but the phone has its own menu structure, icons and other nice trinkets. I would like to start the description with two working modes: the phone mode (with a closed flip key-pad) and a full-screen mode. The main differences are in the presentation of information. Naturally, when the screen is small it can contain less information, that's why in the standby mode with a closed flip a user sees only a data, time, signal level, battery level and a set of icons to access the most often used applications. 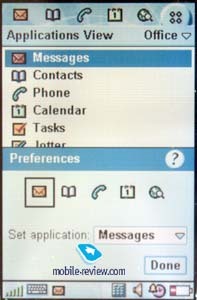 You can also view a whole list of applications, each utility changes it interface to present an information compactly. The list of available applications reduces to 9, the most important ones. For example, you can view only current events in your organizer, the whole calendar is not available. 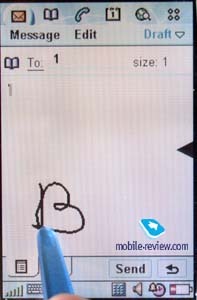 In Jotter application you can only view and edit a text, a picture isn't displayed. This list can be continued. 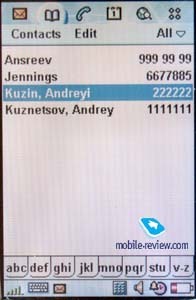 In the whole the phone provides an access to the most required functions. Extend possibilities are available only in the full-screen mode. When the flip is closed, the screen doesn't respond to stylus taps, I think it's logical. You can also lock a key-pad and switch a silence mode with a help of JogDial. 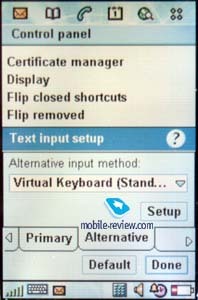 So the quick access prevails over the features while the closed flip.. 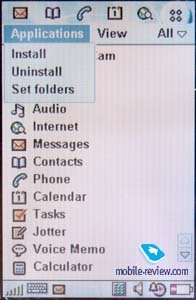 The main menu can be displayed as a list or as a set of icons. There are also application groups, you can create your own folders and rename existed ones. As mentioned above you have two ways to move through the menu: with a help of JogDial or using a stylus. But stylus is irreplaceable if you are going to know an additional information. For example, when you click on the indicator of a battery level, you'll see a bubble help with accurate data. You can't do it with a help of JogDial. Text input. There are two ways of text input: the first is with a help of on-screen key-pad and the second is writing them with a stylus (only for English). The work with an on-screen key-pad is clear, there are 3 bookmarks - for numbers and characters (for English) and local symbols (another language). A handwriting must be explained more elaborately. 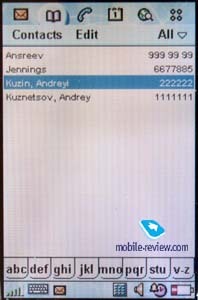 Let's see how it works by the example of creating new SMS messages. The screen which is divided by a small triangle (in the middle on the right) is displayed a blinking enter cursor. You can write on the screen and the data will be immediately displayed at the place of cursor location. The area above the triangle is used for numbers and characters entering and the area under it is used for symbols entering. You should write the words separately, letter by letter. The speed and the quality of recognition is rather high, there were almost no mistakes after a short training. So you can use two, no, even three ways of data input taking into account a usual for mobile phones way, with a help of key-pad. But the third one is seemed to be slow and unnecessary. 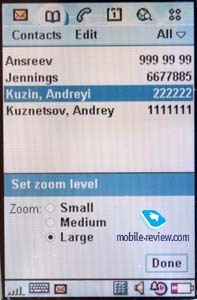 A Zoom feature is available in almost every submenu, it allows to increase and reduce the font size. As a rule the phone supports three font sizes, it enables to set up the most for you convenient way of information presentation. Let's view the main features, at last. You can see a camera lens on the back of the smartphone. It doesn't cover with a shutter. The lens can be scratched and that's why it difficult to wear a handset with some other things. On the other hand, the mechanism of the camera lens is rather simple and minor scratches won't influence the quality of the photos. In the manual guide it is recommended to keep a minimal focus distance of 30 cm while taking pictures. The user can choose one of the three quality levels of the images (JPEG format, 24-bit depth colour) - high, medium and low and one of the three images size (640x480 pixels, 320x240 pixels, 160x120 pixels). It's clear that low resolution means not only small file size but also low quality. You can take less pictures on the higher resolution but their quality will be much better. On the pictures below you can see the quality of camera. 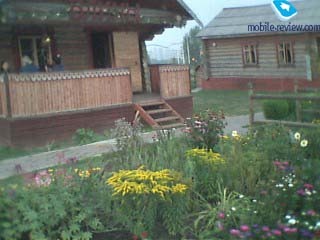 On this link you can compare the photos of one place. They all have a different quality level and a different size. Another link for pics with maximum quality. In my opinion it's better to put a resolution of 320x240 pixels if you plan to view images on the screen of P800, when the resolution is higher the quality doesn't raise much. 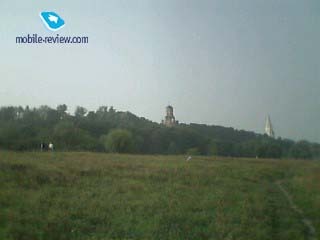 The higher resolution is seemed to be useful while viewing images on the PC screen, but the quality of the photos is too low to do it. The photos can't be even compared with the photos taken by modern digit cameras. A matrix size and a camera lens quality are those negative factors that influence the quality of the photos. On the other hand it's obvious that this camera must be used only to make a photo of a person to associate it with a phone number in a phone book. It can be well-done with a help of the integrated device but, please, don't expect more. 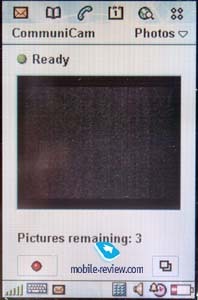 While using the camera part of the screen works as a viewfinder (192x144 pixels), which displays a designated area. Under it you can view how much photos are left under your settings. The camera can be used in open and in closed modes. In the open made you should press the shutter button to take a picture. To download an application in the standby mode you also need just to press the same button. 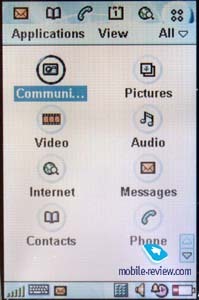 The camera is similar to MCA-20 by it quality but CommuniCam has more additional settings. You can choose a light level, adjust brightness, contrast, frequency of screen renovation (when this index is high the screen works properly even at high speed of moving). There is also a so nice feature as delay timer in this camera. The handset has a 10-second pause, it gives you time to find the best position in front of the camera. 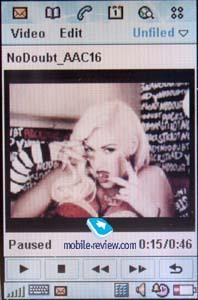 An audible countdown alerts when the picture will be taken. Images taken with the camera can be easily transferred to PC with a help of specific utility or via IR-port or Bluetooth. 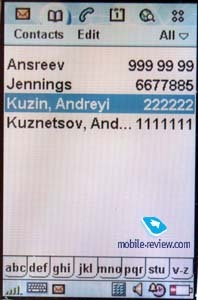 You can also send them as MMS message or attached them to e-mail. 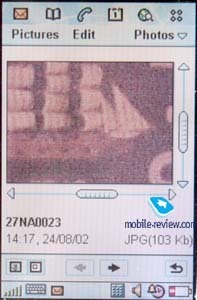 Of course there is a pre-installed software (Image Viewer) to view the images in P800. 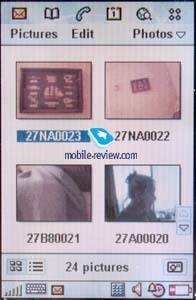 The photos are displayed as thumbnails or the list of files on the screen. You can view each file separately, then such information as size and date will be available. 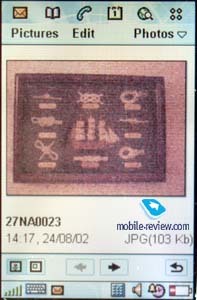 The picture will be shown in a full-screen mode. You can zoom this image but you'll need to use scrolls to view parts of the image. All photos are stored in one folder but you can create your own folders and keep your pictures there. This utility shows all images that have JPEG, GIF or BMP formats. It also enables you to use your pictures as wallpapers or screensavers. Sometimes it's very pleasing. Besides, you can copy any image from this application to the clipboard. Packet Video player is placed here. If you are interested in details (format, image quality and so on), see the manufacturer's site http://www.packetvideo.com/. As for me I think that the quality of video (mpeg-4) is quiet good, though by eye about 15 pictures per second are displayed. 1 minute of video-clip occupies approximately 1 MB of memory space. So it's logical to use MemoryStick to store files. You can also download them from Internet via packet data exchange (GPRS). A standard audio player is positioned here. It supports MP3, AMR (dictophone records), AU, WAV and MIDI formats. All records can be arranged by several features, it's possible to create new folders and move files there. You can't control playlists though this function would be useful to listen mp3-files. 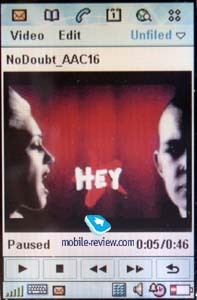 There are rumors that later an advanced audio player appears, which will support almost all functions, including playback of music from MemoryStick. Then you'll be able to use P800 as an mp-3 player. Two words about a Dictaphone. As usual as far as SonyEricsson devices as concerned there are no claims to it quality. It has no time limits (only limits of memory space). According to the manual guide the Dictaphone works in both standby mode and talk mode. But I couldn't find appropriate item. I hope that not a mistake in a manual guide and this item will appear in near future. About other applications and features we will speak next time.